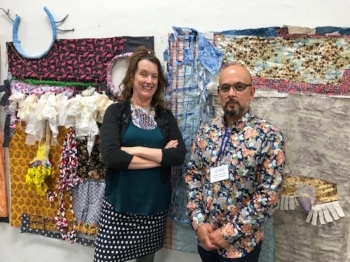 Profoundly interested in the idea of hybridization (sparked from her Hapa heritage – she is ½ Japanese and ½ Caucasian), Solomon’s mixed media works revolve thematically around domesticity, craft, and masculinity/femininity, and often the pursuit of art as science/research. She is frankly obsessed with color/color theory and is drawn to found objects tending to alter them conceptually so that their meanings and original uses or intents are re-purposed. She often fuses “wrong” things together – re contextualizing their original purposes, and incorporating materials that inherently question and skirt the line between ART and CRAFT. Margaret Timbrell uses humor in her embroidery works to examine the way language is used today through technology. The San Francisco based artist adapts phone texts that have been altered incorrectly through the use of auto correct. Her work poses questions regarding the quality of language and how we communicate/miscommunicate with one another. Alise Anderson was born in Houston, Texas. From 2007 to 2009 she studied Modern Dance Performance and Choreography at Utah Valley University. Later receiving a certificate in Directing and Producing at Berkeley Digital Film Institute. With her work, there is a subtle humor in everything she creates, even if it stems from a darker memory, story or feeling. She uses traditional fiber art practices, often painstaking and time-consuming, labors of love to tell these stories, adding another layer to the work's interplay between things tender (soft) and severe. Her work has been featured in KnitWit Magazine and Kole Magazine. Anderson currently lives and works in Oakland. Liz Harvey is an interdisciplinary artist whose sculpture and performances have been shown in galleries, museums, and alternative spaces, including a national park, a riverbed, and an arroyo. Harvey works in sculpture and performance, drawing on craft processes to explore loss, history, and imagined futures. For her performance projects, she collaborates with musicians, sound artists, dancers and scientists. Harvey's work looks back and forward – she makes elegies and predictions. 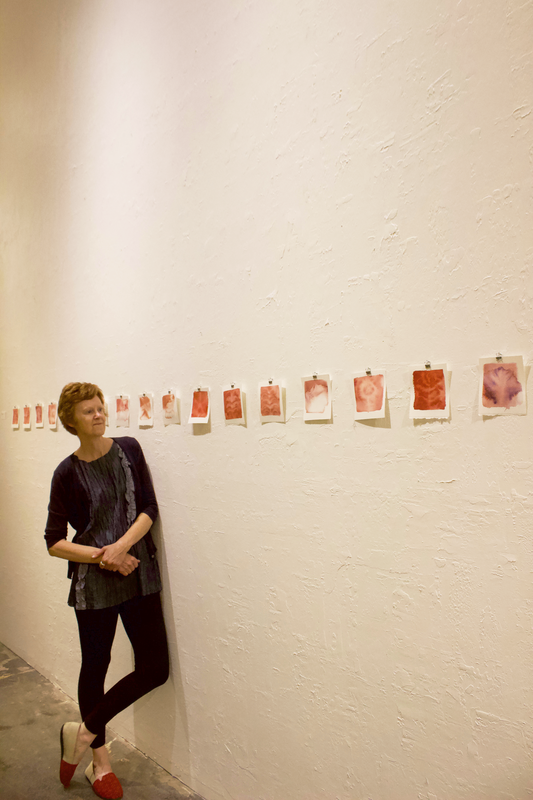 By engaging with “women’s handiwork”, her current work explores plant-human relationships. Most recently her work has focused on time - through considering the increased rate of plant extinctions and the ongoing decline of the planet’s biodiversity. Harvey’s work “actively engages the rich and multifarious history of feminist art practice, while also attesting to a highly personal and singular vision,” according to Los Angeles critic, artist and poet Eve Wood. Click here to see Liz Harvey's multiyear durational performance project, the lost ones. Collaborative duo, Michelle Wilson, and Ann Beck bring us their Rhinoceros Project. Their participatory project is based on Albrecht Durer's print by the same name. Their work is a commentary on our environment and the extinction of species. During their residency, the two will facilitate sewing circles and paper-making happenings. Click here for more info on The Rhinoceros Project. interdisciplinary artists describe their practice as a dialog of making, and they are interested in the juxtaposition of materials and response to space (architectural and natural) in their exploration of complex emotional states, social justice, and contemporary culture. RoCoCo’s work most often takes form through sculptural installations, but has also included video, performance, drawing, painting, and audience participation. RoCoCo began collaborating in 2015 at Mercury 20 Gallery in Oakland, California, and has gone on to show work at the Oliver Arts Center in Oakland, and the Montalvo Arts Center in Saratoga. Heather Deyling is an artist and educator whose current and ongoing body of work, the “Invented Hybrids” series, includes works in drawing, glass and fiber-based sculpture. Her studio practice is driven by research and observation of natural forms, such as succulents, fungi and marine invertebrates. Laurie Shapiro’s large-scale, tapestry-like, mixed-media paintings are sometimes viewed from the wall and sometimes walked inside of. Fascinated by color and process, Shapiro initially builds up her paintings by hand-sewing painted segments and drawn screen prints on raw muslin, followed by layers of over-painting. From afar, her pieces look like paintings, but when viewed more closely, one can see the hand-stitching of her screen printed drawings. A few artists she admires are Roy De Forest, Gustav Klimt, and Kerry James Marshall. Cristina Velázquez is an interdisciplinary visual artist who reuses and transforms everyday obsolete objects into works of art, addressing feminist and ecological issues through the term Ecofeminism. Velázquez earned a Bachelors of Fine Art with a concentration in painting from San Jose State University in 2001, and a Masters of Arts and Masters of Fine Arts, Dual Degree from San Francisco Art Institute in 2017. Amy Ahlstrom is an urban quilter creating modern pop art. Inspired by the street art, signage, and graffiti in city neighborhoods, Amy takes digital photos of found images, sampling and remixing them into urban quilts. Using hundreds of digital photographs, she designs collages by computer, makes paper patterns, and hand-cuts and sews quilts. The resulting quilts, made of silk and cotton and stretched onto frames, are tactile visual postcards of urban environments. They re-imagine the urban landscape and re-invent quilting as a pop art medium.